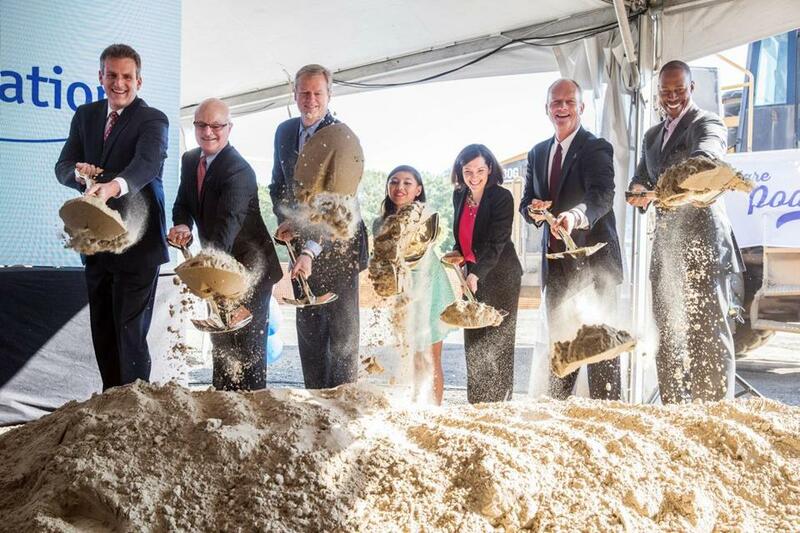 Employees, customers, and supporters of Insulet Corp. joined Massachusetts governor Charlie Baker (third from left) to symbolically shovel dirt at Insulet&apos;s new headquarters in Acton on Thursday. When Insulet Corp. chief executive Patrick Sullivan wanted to shift some of his manufacturing from China to the United States, he looked at sites across this country. In the end, though, Sullivan settled on a location less than 15 miles away from Insulet’s Billerica headquarters: a former Digital Equipment Corp. office building in Acton that has been vacant for at least 15 years. Sullivan’s choice was made in part because of the skilled workforce available in the area. The nearby location also gave Insulet an opportunity to move its headquarters there. And the millions in state and local tax incentives didn’t hurt, either. Sullivan said it will be cheaper for Insulet to make its flagship device — the Omnipod, a tubeless insulin pump for diabetes patients — in the United States than in China because of the new plant’s automation and rising labor costs in China. Insulet held a groundbreaking ceremony at the Acton property Thursday, where it expects to open the plant in early 2019, eventually adding hundreds of manufacturing jobs and nearly 500 corporate office workers. If Insulet’s sales forecast to reach $1 billion in annual revenue by 2021 holds true, Sullivan said the company could employ as many as 1,500 people at the property. The company is projected to generate as much as $450 million in revenue this year. Insulet’s factory in China is run by a contract manufacturer, has more than 2,000 people working there, and expects to produce about 20 million Omnipods this year. Sullivan said the Acton plant will more than double Insulet’s manufacturing capacity. Making the devices in-house, he said, gives the company greater quality control. Insulet paid more than $9 million for the 26-acre property in February. The Massachusetts Life Sciences Center estimated Insulet could end up investing at least $170 million in the property, including construction and equipment costs. The Life Sciences Center will provide more than $1.6 million in tax credits to Insulet, in return for the promise of 110 net new jobs. Acton, meanwhile, has approved a tax agreement that is projected to save Insulet $2.8 million in property taxes over 20 years.